Ideally suited for finished part application. 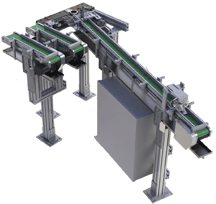 MAC Automation has been designing conveyors since 1985. 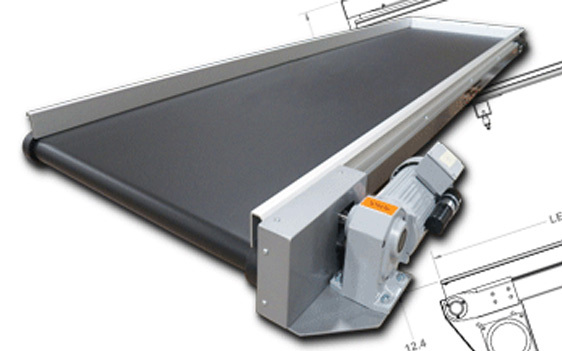 Our Conveyors can be ordered in standard models or can be custom designed by our engineering and production staff to fit your company's individual needs. Ideal for Storage and Transfer of Material. Here at MAC Automation we specially design our Resin Bins. Manufactured of Heavy Duty Polyethylen for toughness, durability, easy cleaning and visibility of contents. Provide a cleaner, more professional appearance at the press. All part chutes are made of soft pliable bondcote material, which protects delicate parts from surface damage. For over 30 years MAC is committed to providing superior quality and economic value to its customers. We serve the Plastics Industry with auxiliary equipment including: Conveyors, Plantwide Automation Equipment, Automated Box-Fill Systems, Portable Resin Bins, Resin Loaders, Part/Runner Separators and diverters, Inspection Tables, Cleanrooms, Drum and Gaylord box Filter Covers, Air Conveying Systems, Robot Guarding, Mold Side Curtains, Tie bar Sleeves and Under-Press Part Chutes. MAC offers customers high quality cost effective automation solutions. We have a professional sales staff that will listen to your requirements and then provide you with custom quotes. Our engineering staff can design custom automation products to fit those requirements. With a skilled production team we can make your automation solution a reality. 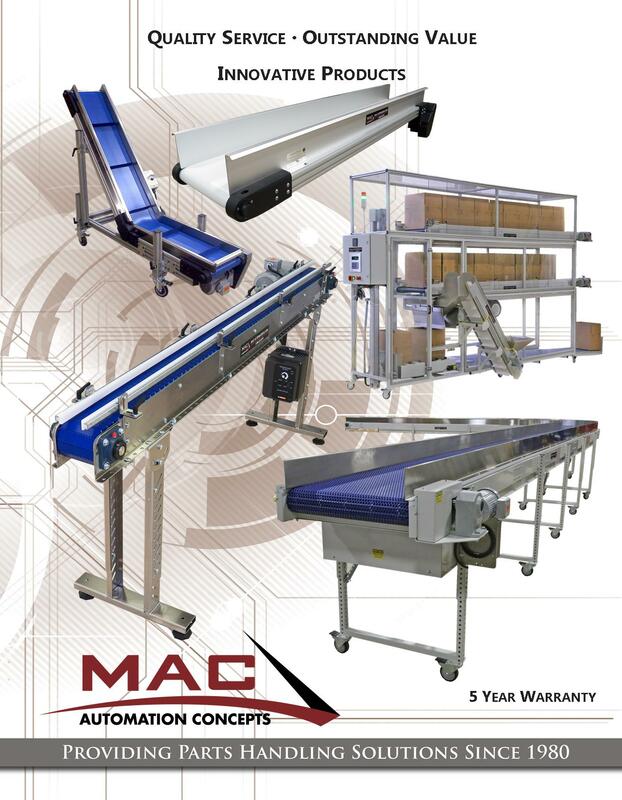 MAC designs and manufactures conveyor systems, automatic box-bag-filling or Tote Fill systems by weight or count, HEPA-filtered clean rooms and enclosures, part/runner separators, vertical transfer platforms, robotic and part conditioning conveyors, and plant wide engineered part-handling systems. 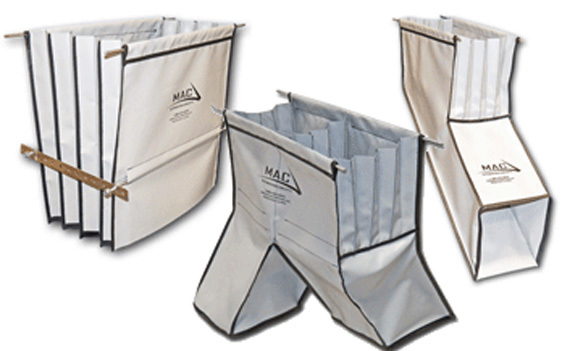 Also provides parts-containment solutions with custom mold-side curtains, guide skirts, debar sleeves, and complete line of stackable 75-1200 lb. 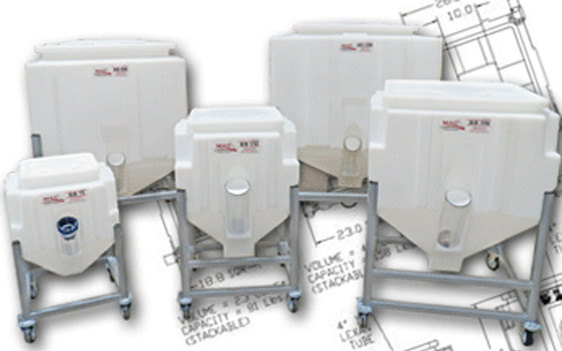 mobile resin bins, and Gaylord/drum filter covers designed to keep in-process materials clean. Mold-side curtains, guide skirts, and debar sleeves prevent product loss and contamination by containing the shot and funneling it into a conveyor or box. MAC is the first and last company you need to contact.